The Pays d’Auge in Lower Normandy is a land of dense thickets, timber-framed cottages and undulating hills. Its gastronomy is famous for ultra-creamy butters and other dairy products, courtesy of speckled cows which boast chestnut-coloured patches circling their docile, chocolate-brown eyes. However, this area is also home to apple orchards, their trees heavily laden with bittersweet fruits to be pressed, fermented and distilled into a golden liquid whose very name marries the département in which it is made with its most prized output. 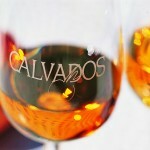 Calvados brandy is an amber-hued, glossy liqueur that’s renowned for its sweet aroma and smooth, layered flavour. Distilled from cider pressed in Normandy, it isn’t uncommon for over 100 different apple varieties to be combined to create an intuitively balanced, fine-tuned brandy. The designation ‘Calvados’ signifies both the département in the Pays d’Auge – famed for its Bayeux Tapestry and the D-Day beaches – and this eponymously-named nectar, which has been produced here for 500 years. Though distilled cidre only made its first written appearance during 1553, in the diary of a Norman forester named Gilles de Gouberville, the mentions of apple orchards and brewers date back as far as the 8th century, notably by King Charlemagne, and Normandy’s apples even feature in Roman Gaul scriptures. The region’s variety of flavoursome, high-quality pommes – from Cox Oranges to Melroses and Reine des Reinettes – seem to have been just as highly acclaimed two millennia ago as they are today. These varieties remain unrivalled when it comes to producing tarts, sauces and, of course, ciders and spirits. 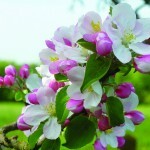 In 1606, apple brandy was declared an official product of the département when a cider distillation guild was initiated. However, it wasn’t until commerce laws were freed up following the French Revolution that its trade began to take place outside of the Basse-Normandie. The drink’s popularity multiplied when it was introduced to the capital under the appellation of Calvados, after Lower Normandy’s newly formed, post-Revolutionary département. In the late 1800s, Calvados production experienced a significant boom thanks to an infestation of grape phylloxera insects which totally destroyed France’s vineyards, halting winemaking for the last quarter of the century. 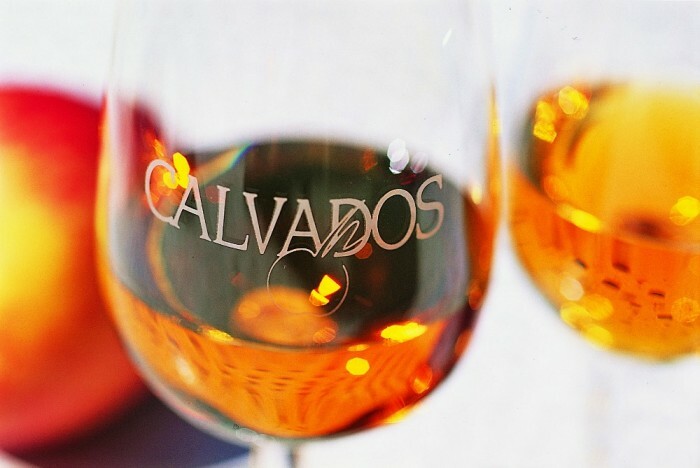 With wine taking a significant hit, Calvados was able to sidle into the limelight, although the austerity caused by two subsequent World Wars were to limit its production once again. In 1942, Calvados brandy was bestowed with an AOC (Appellation d’Origine Controlée) status, a prestigious label granted to high-quality French gastronomic products particular to geographical areas. The distilleries which had been damaged during World War 2 were reconstructed and many of them were modernised, multiplying their productivity. 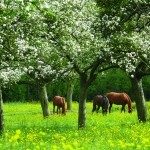 The 1980s saw a cider revival, which boosted the popularity of Calvados to the widespread status that it enjoys today. In Normandy, Calvados is popular in the form of a trou Normand, a small glass of the liqueur that’s consumed in between courses during a meal. The trou is intended to facilitate digestion and stimulate the appetite in anticipation of the next plat and is often embellished by a scoop of pear sorbet, especially on festive occasions, which acts as a palate cleanser as well as a tasty extra. Otherwise, it’s a well-liked digestif or even taken as an aperitif. 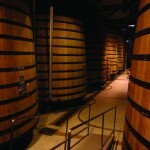 The family-run Calvados Boulard distillery at Coquainvilliers, in the rural heart of the département, may currently export 85 per cent of the world’s output, but it couldn’t feel less like mass-production. It’s sited on a secluded lane in a timber-framed house with an adjacent red-brick, slate-roofed barn which houses the distillery. I arrive on a cool autumnal evening, under a gentle drizzle which betrays the secret behind this region’s lush flora. Clémence, my glamorous guide, eases open the distillery’s heavy door with a suede-gloved hand. Two lines of copper alembic pot stills, fixed on brick bases, glint at us under fluorescent lights. These vast containers date back to the 1970s and were previously used to transport Calvados around the local town. 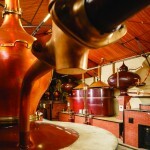 Today, they’re pristinely polished and sustaining the double distillation techniques which have produced brandy here since 1825. Distillation begins each November and continues for 24 hours per day, six days a week, until May. I’m there on the first distilling day of the season and so am privy to the sights, sounds and smells of the active distillery. The air is thick with radiating heat and there’s a noisy hum emanating from the boilers which constantly simmer the specially made apple cider that makes the brandy’s base. The temperature in the distillery will remain at around 30 degrees celsius throughout seven months of the year, when the boiling process consistently emits the homely scent of freshly baked apple pie. 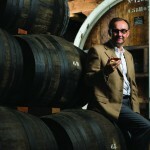 The transformation process from ordinary pomme to world-class brandy is precise: four families of Norman apple varieties are harvested between September and early December, to provide an exact balance of bitter, bittersweet, acidic and sweet fruits. These pommes are inedible and Clémence smilingly admits that eating a bitter cider apple is “a mistake that every child in Normandy makes at least once in their life”. In order for Calvados to qualify for AOC labelling, all the apples used must have been farmed in the Pays d’Auge. 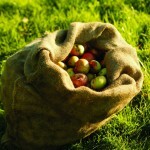 The harvested apples are pressed and left in a vat for six weeks – two or three weeks longer than for normal cider – over which time all of their sugar content converts to alcohol. The result is a flat cider, with seven per cent alcohol content, which is transported to the distillery and piped into the boiler. The cider is heated for eight hours, during which the vapour evaporates into the head of the pot still and the heaviest, best flavours condense back into the boiler. The condensed liquid is then distilled for a further 12 hours, which raises its alcohol percentage to 70 per cent. It’s then stored in oak casks for several weeks, in order to oxidise, during which time the alcohol content decreases to 60 per cent. It then must be left to age for at least two years in order to qualify as Calvados. Some distilleries are beginning to replace the traditional wooden containers with state-of-the-art, chrome-plated vats. I’m glad to see that the Boulards’ traditional methods are held as dearly as their own lineage, which has overseen Calvados distillation for five generations and counting. The ages of the casks determine the drinks’ character – younger examples have stronger tannins, and the size of their wood grain defines the resulting woody and fruity notes. Some two per cent of the Calvados evaporates during this time and that’s traditionally called ‘the angel’s share’ – or perhaps more aptly, as Clémence adds, with a wink, ‘the devil’s share’. As we settle in for a prolonged tasting session, the spiced, woody and fruity variations certainly possess both angelic and devilish properties – the drink’s molten smoothness can betray its fiendish alcohol content. I learn that the colour of the brandy deepens to dark auburn as it ages, its flavour developing intensively as time in the cask goes on. Young Calvados, bottled after its initial two years in the oak casks, has a fruity, lively and actively alcoholic taste that tingles on the palate. It’s pale gold in colour and ideal for cocktails, cooking with or in a classic trou Normand. Slightly less lively but still fruity is the VSOP (Very Superior Old Pale), which denotes Calvados that’s at least four years old. The most popular of all is the XO (Extra Old) variety, which signifies a brandy that’s been cask-aged for at least six years – although it’s often kept in the wood for far longer. The XO provides an excellent balance of wood and fruity notes which makes it a perfect digestif. In comparison, Calvados which has been cask-aged for over 20 years completely loses its fruity notes, leaving in their place spice and wood flavours. A common misconception is that bottled spirits continue to age. Clémence explains to me that only the cask time affects the flavour, and Calvados will taste the same whether it’s uncorked immediately or kept for decades. 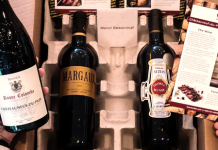 Many like to collect high-quality liqueurs to be enjoyed in years to come and Clémence recommends that they should be stored upright as contact with the cork stimulates evaporation. Calvados brandy undeniably connotes class and elegance, and it happily shows no sign of losing its universal and local appeal. It’s a real pleasure to visit family distilleries such as Calvados Boulard, and to depart with a bellyful of brandy, happy in the knowledge that traditions are being preserved and nurtured. That’s certainly something worth raising a glass to – à votre santé!